Nance, which is a tropical fruit, is also known as Brysonima crassifolia, belongs to the Acerola family and it grows on a large shrub, which reaches about 33 feet in height. It is a plant that grows up slowly and has the ability to withstand droughts for a long period. Nance fruit is small in size and shaped like a berry. It has a diameter of about 1 to 2 cm. They grow as a cluster and when they become ripe, they attain yellow or orange color. There are sweet as well as sour Nance fruits. The odor of this fruit is not very pleasant. The skin of this fruit is thin and the pulp is white, oily and juicy. Two to three seeds are found in this fruit. The bark of Nance tree has medicinal properties and is used for treating various ailments. You can use them internally as well as externally to treat diseases. It is good for treating pulmonary diseases, diarrhea, wounds and rashes. In Central America people take tea made with Nance leaves to treat rheumatism, anemia, aching bones and fatigue. They take it three times a day and it is found very effective. You can preserve these fruits in bottles and keep for months together. You can use these fruits for making jellies and jams. Carbonated beverages are also made with them. You can stuff meats with Nance fruits. 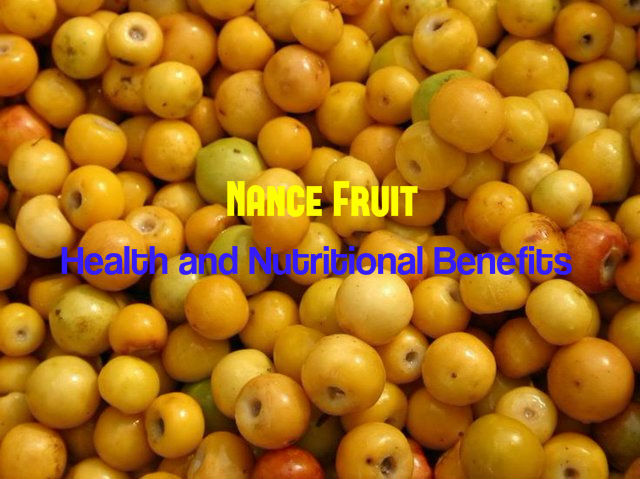 Nance fruit is a rich source of vitamins and minerals like Vitamin K, Vitamin C, Vitamin E, riboflavin, thiamine, niacin, manganese, folate and pantothenic acid. Moreover, you also get enough proteins, fat, fiber, iron, carotene and phosphorus from this fruit. Tannin is also found in high quantities in this fruit, particularly when they become ripe. Nance fruit is a storehouse of Vitamin C and this is a vitamin that you need in your body for various functions. If you take adequate amounts of Vitamin C, you can protect your body from various infections. It also helps in providing you healthy bones and teeth. Nance fruit can make your body immune to virus, bacteria and infections and also improves the ability of your body to heal wounds. So, if you have wounds on your body, consume this fruit regularly for healing them fast. Vitamin C is also important for collagen. This is an important structural protein found in the connective tissue. Protein is found in good amounts in Nance fruits. As you know, protein is essential for the growth and development of the body. So if you include Nance fruits in your daily diet, the metabolic and physiological activities of your body will be improved. This fruit is also beneficial for enhancing the activities of your nervous system and immunity system. Nance fruits help you fight against the damaging actions of free radicals and therefore keep you away from various diseases and unhealthy conditions of the body. Nance fruits is rich in calcium and this along with Vitamin K plays an important role in making your bones strong. It also protects you from arthritis. Vitamin K is essential for the clotting of blood as well. So, consuming this fruit regularly helps in preventing bleeding gums, bleeding nose and other such problems. Being a rich source of thiamine, Nance fruits are very beneficial in the production of neurotransmitter. This plays an important role in relaying messages between the nerves and the muscles, thus making sure that the cardiac function is normal. So, consume Nance fruits regularly and prevent irregular functioning of the cardiac system. Nance fruits are rich in riboflavin and this helps in the proper metabolism of carbohydrates, fats and proteins, thus providing you with energy. You can also enhance the production of red blood cells and antibodies in the body by consuming Nance fruits. If you are suffering from depression and dementia, consume Nance fruits regularly. This will help you to overcome these symptoms and remain energetic. Folate is essential for the improved functioning of your brain also. Your brain is kept young by consuming Nance fruits. It also helps in improving your memory power. Nance fruits have great anti-aging properties. You can reduce the process of ageing and also keep your body healthy and strong by consuming Nance fruits. When you get older, you can see dark spots, wrinkles and fine lines on your face and your skin becomes dull. These are signs of ageing, which you cannot prevent, but reduce to some extent. Nance is a rich source of beta carotene and this gets converted to Vitamin A in the body. Vitamin A has anti-ageing properties and keep you looking young and glowing for a longer time. So it is a super healthy food for your skin. Nance fruit is great for your skin. It helps in cleansing your skin and making your skin smooth and beautiful. You can add this fruit in your daily diet in the form of salad and you will see how it changes your skin for the better. You may also crush Nance fruits and add honey and yogurt to it. Apply this mixture on your face and wash off after 15 minutes. This will give you bright skin and enhances your complexion. Nance fruit is also good for your hair and keeps your hair bouncy, smooth and soft. Having Nance fruits regularly help in losing weight as well. They are very low in calories and fats and you can consume it daily without any fear of gaining weight. These fruits keep your stomach full for a longer period of time and as a result you will take in less amount of food. This in turn reduces your weight. Within a month of taking these fruits you will see a reduction in your weight. So, include Nance fruits in your daily diet and you will be protected from various diseases and ailments. Great thoughts with nice explanation. And it is very intrusting. And I greatly impressed about your blog. Thank you very much for sharing this information with us.